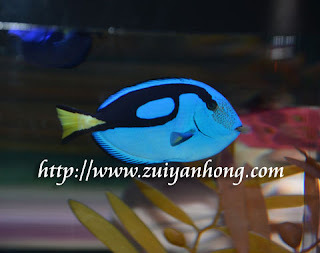 Palette surgeonfish is another marine aquarium fish which is displayed in Seoul Coex Aquarium. This fish belongs to tang family. The other names of palette surgeonfish are blue tang, regal tang, hippo tang, royal blue tang, blue surgeonfish, pacific blue tang and flagtail surgeonfish. The body of palette surgeonfish is royal blue in color. There is a black palette shape on palette surgeonfish's body. The tail of palette surgeonfish looks like a yellow scalpel or surgical knife. When palette surgeonfish is in danger or fight for territory, it will use the scalpel tail to threaten its enemies. The pH of water have to be stable at 8.1 -- 8.3. The aquarium measurement should be 120 x 60 x 60 cm. Keep the temperature of the water between 24°C -- 26°C. You can feed palette surgeonfish with dried pellet food and frozen marine food. Live fish and Chinese cabbage is another alternative because palette surgeonfish is omnivore.